Find the right RV storage at Blue Mound 287 Self Storage. We offer three different types of RV storage options to better fit your self-storage needs. Call us today at 817-439-1380 and ask about our storage space outdoors, covered parking options as well as indoor RV storage! Can’t make up your mind on what storage option fits you best? No worries, our team of professionals is always a call away to help answer any questions you may have about our storage space! To many, an RV is an investment, an escape, something that is not used on a daily basis. It is also something that take a lot of room up, room that may not always be available at home. Not to mention, RV’s can be pricey! So why let thousands of dollars take up needed space or get exposed to harsh weather, theft and more? Doesn’t make sense now, does it? At Blue Mound 287 Self Storage, we understand that you want to protect your possessions and have access to them without a hassle. That is why we offer 24/7 secured access to our tenants with state of the art security throughout the entire property! So how do you choose the RV storage option that fits your needs best? Let us help! 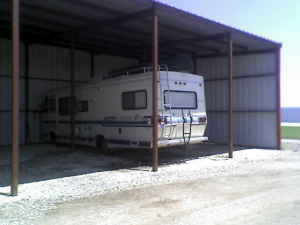 Below, you will find a little more information about finding the right RV storage for your RV. We provide outdoor storage in our gated facility! Those looking to lease outdoor storage space usually need something temporary or short term. While it is true that outdoor storage will be the cheapest storage solution for many, it also leaves RV’s and vehicles with the least coverage. It is not recommended to keep items without heavy duty car covers in outdoor storage. Adding a cover will minimize dust exposure and protect better against extreme weather. Even so, our outdoor storage is offered in a designated area. You can trust your RV, car or even boat to be safer than left at home. Give us a call now and see what spaces we currently have available outdoors! Our next step up with added coverage is covered storage space. Think of our covered storage space as the upgraded parking in an apartment complex. You pay a little extra for covered parking, but you have your designated spot. You can always count on your spot being available and you do not have to run down three flights of stairs during a hail storm to put a blanket to protect the glass. While some see covered parking as a “luxury” or that you “pay for convenience”, the truth is, you are paying for secure self storage. Our covered storage space has wide lanes that make it easy to maneuver and we offer different size options. Store your truck with your boat or even your RV! It’s great, come check it out! Our spaces also allow you to work on your vehicle without added sun exposure! Explore all of our options today. Did you know that we offer storage units large enough to fit your RV? Well if you didn’t, know you do. Our climate-controlled storage units offer the ultimate luxury when it comes to self-storage needs. They also offer the most protection against extreme weather, humidity and sun exposure. Minimal dust can be found inside each storage unit, just normal dust accumulation like in any home. The air-conditioned units are kept at a constant temperature year-round without you having to adjust the temperature. These units are strongly recommended for temperature sensitive items as well as RV’s that are not used year-round. Now that you have learned a little more about your storage options with us, what are you waiting for? Protect your investment with Blue Mound 287 Self Storage, we will be waiting for your call!